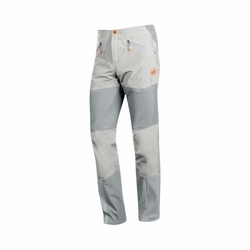 Mammut Nordwand HS Flex Pants. Challenging terrain requires demanding clothing: the Nordwand HS Flex Pants Men are made of a carefully considered combination of materials with 3-layer GORE-TEX material and innovative, highly bi-elastic GORE-TEX Stretch material, which makes the pants not only comfortable but also weatherproof. The use of highly bi-elastic GORE-TEX Stretch material on the thighs affords you increased freedom of movement, while the sections on the hips and leg hems provide a perfect fit and weather protection. Mammut Vertical Motion Technology optimizes the ergonomics during alpine movement sequences. The crampon protection and climbing harness-compatible front pockets with waterproof zipper in a matt look prove practical so that you are prepared for everything on the terrain.